Now is the time to add a raffia bag (and shoes) to your collection. This style makes a chic accessory for the Spring/Summer.. Whether it’s a weekend getaway or a long trip, it is always best to carry a travel bag that’s sturdy and durable, aside.. Although mini bigs are still a thing, oversized bags are also getting its fair share of attention. Balenciaga has released a variety of..
Metallic bags will surely bring a sparkle to your style. These designer bags can be used from day to night, anytime of the..
As Christmas Day gets closer, we have compiled some clothing and accessories for the Holiday season. Red, green, glitter and embellishments are some.. The 2016 Pantone Color of The Year are Rose Quartz and Serenity. The two colors brings in warm and refreshing tones. Rose Quartz.. 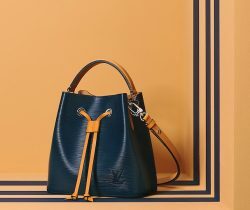 Introducing the Loewe Puzzle Bag. The Puzzle Bag is handmade in Spain and presents a unique trapezoid shape. The bag is embossed with..